If we assume Bajarin’s number is 1m and combine with Slice’s market share figures, it implies Q1 2018 had 10 million smart speaker unit sales, and a prospective annual units of 30m to 40m. I’m skeptical. How many in the USA? There are about 80m households in the USA. Two years of sales at 40m per year means every household will have one. Another two years, every household will have up to two. That kind of market penetration is frankly unbelievable. And that’s after the Echo has been in the market for 3 years. Apple maybe has filled the channel with a million units maybe, but I’d be skeptical of that too. Seems plain ridiculous, as there isn’t any need to do that. 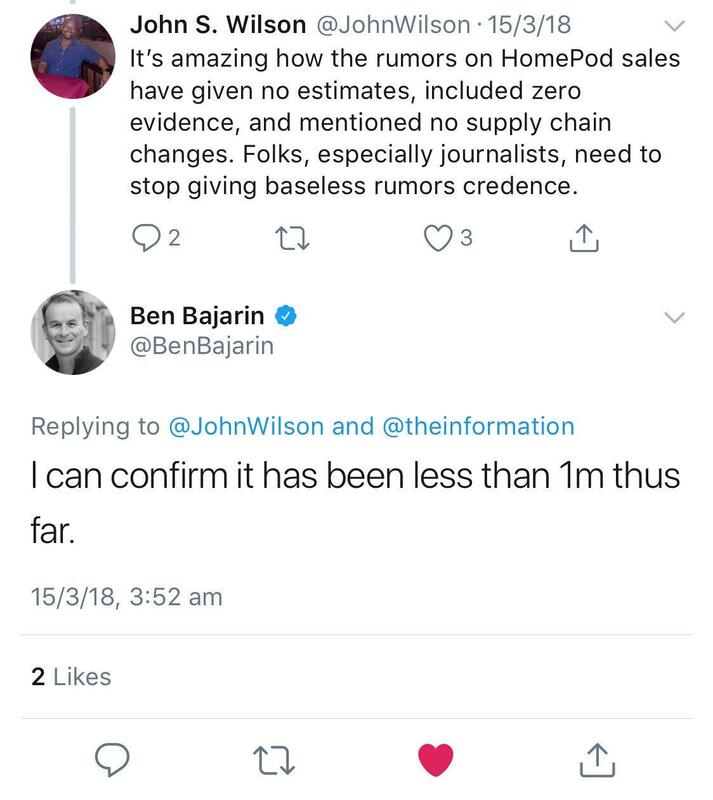 So maybe by less than 1 million, Bajarin meant 250k units. Weak demand! Oversupply! Too much demand! Inability to deliver on time! Supply chain confirms Apple is screwed! Analysts predict blockbuster... or not... sales! Like any of its products Apple does not provide anticipated unit sales. The ONLY guidance Apple provides is to revenue, gross margin, operating expense, OIE and tax rate. Nowhere in there is there any reference to unit sales of ANYTHING. The ONLY entity that knows how many HomePods Apple has ordered, sold or expects to sell is Apple itself. Apple will not share units sold data if and not until revenue from the product in question becomes material (5% of revenue). That’s why we haven’t heard anything about Apple Watch results, and it has been selling for three years. Anybody that hat expresses knowledge of these things is a liar. Period. Then we have Bloomberg’s track record for accuracy (not good ar all). Anybody expressing that that they know more or better than Apple management is one of two things: delusional, or an Android shill masquerading as an Apple product user. I kind of have the same feeling as I had about Apple Watch. I like mine as well, and while may not be as good as others expect it should be I haven’t had any problems with it. What at I don’t understand is why so much credence is given to negative comments by people that don’t even own one. declaring HomePod a failure, based on nothing, after less than 3 months on the market is just plain stupid. Those “in the know” said the same thing about the Mac, iPod, iPhone, iPad, AirPods, and Apple Watch using the same primary arguments (price is to high, doesn’t work, Apple is playing catch-up). Look how wrong they were, and continue to be. What keeps me away is the Apple Music subscription to get the full featured device. Yes, you can get utility without it, but it just isn't that attractive to me. I just really dislike subscriptions. If it came with lifetime access to Apple Music (on the single device) I'd look again. And Apple isn't going to do that. The positioning is great: High-quality audio, and by the way it has a personal assistant (the competition did it the opposite way). Except that the "by the way" part is terrible (so far?) in comparison. The price will be fine when Siri is better and it can be stereo-d and AirPlayed. Everything now is too early, including their announcements of coming products. It shows fear. And greed. Slow. The. Hell. Down. And do everything way faster. I’m obviously not there, but according to Apple, Siri on the iPhone will take priority if you raise the phone (i.e. screen is active) to make your “hey Siri” request. Since you didn’t explicitly say you were doing this, I thought it might be possible that you weren’t doing it, and that should fix the issue. You can of course also solve this problem by turning off Siri listening on the HomePod, though this would mean that to adjust the volume you’d need to get up and tap the top of the unit. How could the author of this article leave out the fact that the Homepod is only on sale in 3 countries??? LOL. Do you think that "minor" detail has anything to do with sales? (Assuming source is even accurate)Apple is waiting for the final kinks to be worked out with Airplay 2. Come on guys, get your helmet on and get in the game. Whenever I can buy a HomePod, I'm going to use it as a dumb speaker to stream music from my iPhone or Mac. Siri is useful when I dictate messages on my Watch, or when I want to make calls while driving. I never use it when I'm sitting down. So if Apple is not able to sell the HomePods in the 3 countries it has released, please send it off to your secondary and tertiary markets. You'll definitely sell them to a few. Then again, I wonder what has to be in place for the HomePod to be released in a market. If the market should have a functional Apple Maps then I think I won't be seeing it in a long, long time. Stop talking about a product that you know almost nothing about!! I am sick of the misinformation being tossed around as facts to degredate the HomePod ... it's really getting quite old.. I have personally played Apple Lossless files that were ripped from CD ,directly from iCloud drive via airplay with my iPhone 8 Plus on HomePod. You can absolutely play any non apple purchased music added to your iPhone, iPad, or iPod touch via airplay. You can also play your own personal music from iTunes match using any iOS device with what?? You guessed it..airplay. As well as music from ANY other competing service via airplay from an IOS device..
Sonos is a Wifi only speaker and has done pretty damn well prior to HomePod and without bluetooth support. Google Home Max is $50.00 more than HomePod..Sonos play 3 and play 5 are priced just below and above the HomePod, One of these two is the route I was planning on going.. yet still with no airplay capability it was a deal breaker for me. I prefer the range and quality of airplay vs Bluetooth.. Others may disagree because it keeps you in Apple's ecosystem but that is not an issue in my household. AirPlay is a network streaming system that works atop your Wi-Fi (or someone else’s…you just need a wireless network for it to function). The strength of the AirPlay protocol for audio is that it uses UDP for streaming audio which has a low overhead. The Apple Lossless codec (AAC Lossless) is what makes up the audio streams, that means stereo audio is sent at 44.1kHz with AES encryption. AirPlay also buffers the stream for 2 seconds so that dropouts are practically non-existent provided your wireless network is even moderately stable. Audio source data transmitted via AirPlay is also sent completely unprocessed with no deterioration in bit depth. Sound quality, as a result, is pristine. Since the original source is sent exactly as transmitted, AirPlay has the added benefit of using the destination devices to individually control the volume. AirPlay sends metadata along with the audio stream and is known for tracking that data efficiently, so album art, play duration and feedback controls are both accurate and quick. Since AirPlay uses Wi-Fi and not Bluetooth, the range is significantly better, with AirPlay devices having the ability to be placed anywhere in a home or office—even if the controller or source device is a significant distance away from the output device. The downside to AirPlay, of course, is that it is an Apple-only protocol, and thus only available with Apple software and hardware. Because it Is proprietary, manufacturers of AirPlay-enabled speakers and other AV equipment pay a licensing fee to Apple to use the technology and make it available in their products. Other than an occasionally asking for a song I have no real need for Siri or any assistant for that matter. Again others may feel differently I am just stating what my needs and usage are as far as Siri or other assistants are concerned. If someone wants to play something when they come over and they have an Android phone I can easily play what they want by handing the iPad or iPhone to them, or by asking Siri via Apple Music... which work pretty well for me..again others may disagree..this is just my experience .. I know for a fact that they haven’t even put the homepod on sales in many EU countries. So why should they cut back production if most part of the world can’t order them yet? Until this speaker stays clueless and Siri dumb, this is what you get. Make it useful then we might buy this before Alexa. Slow down and go faster. Got it.